Pic via Helicopter Pics Instagram Page. 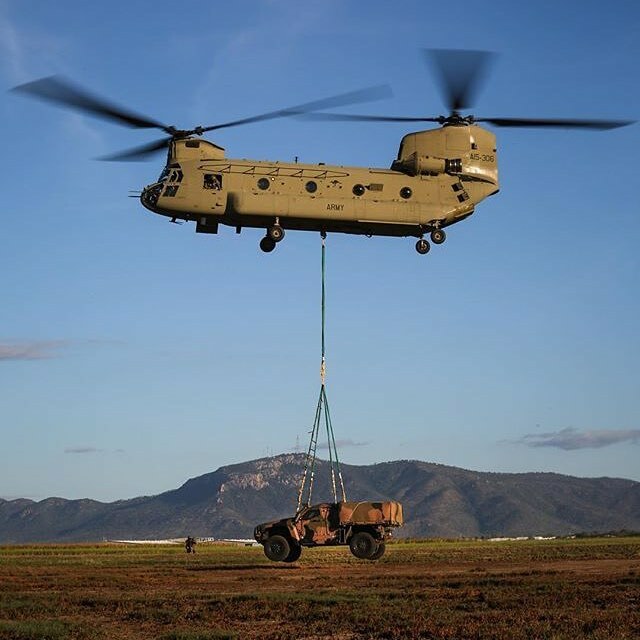 From 26-30 June 2017, external lift trials were conducted with an Australian Army CH-47F Chinook, and the two-door and four-door variants of the Hawkei Protected Mobility Vehicle (PMV). Held at RAAF 🇦🇺 Base Townsville, the trials assessed the practice and techniques required to safely attach and carry the Hawkei, which weighs approximately nine tonnes. The trials were conducted by the Capability Acquisition and Sustainment Group’s Land 121 Phase 4 project team and Air Mobility Training and Development Unit (AMTDU), a joint Army and Air Force unit tasked with establishing air load techniques for new equipment and vehicles, and training personnel in this practice.